The Red-Green Alliance held a gathering at Blaagaardsplads in Copenhagen commemorating International Workers' Day before marching to Faelledparken to participate a traditional event where representatives from the Political Left and Centre-Left gave speeches, including the Danish Prime Minister, Helle Thorning-Schmidt. International Workers' Day in Copenhagen. The Red-Green Alliance held a gathering at Blaagaardsplads before marching to Faelledparken to participate in the traditional Workers' Day event, where representatives from the Political Left and Centre-Left gave speeches, hereunder the Danish Prime Minister, Helle Thorning-Schmidt. Party leader Johanne Schmidt-Nielsen speaking to the assembled at Blaagaardsplads. International Workers' Day in Copenhagen. The Red-Green Alliance held a gathering at Blaagaardsplads before marching to Faelledparken to participate in the traditional Workers' Day event, where representatives from the Political Left and Centre-Left gave speeches, hereunder the Danish Prime Minister, Helle Thorning-Schmidt. Supporters of the Red-Green Alliance marching towards Faelledparken. International Workers' Day in Copenhagen. The Red-Green Alliance held a gathering at Blaagaardsplads before marching to Faelledparken to participate in the traditional Workers' Day event, where representatives from the Political Left and Centre-Left gave speeches, hereunder the Danish Prime Minister, Helle Thorning-Schmidt. Spectators watch the protesters as they make their way towards Faelledparken. International Workers' Day in Copenhagen. 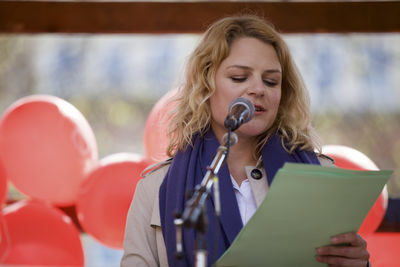 The Red-Green Alliance held a gathering at Blaagaardsplads before marching to Faelledparken to participate in the traditional Workers' Day event, where representatives from the Political Left and Centre-Left gave speeches, hereunder the Danish Prime Minister, Helle Thorning-Schmidt. 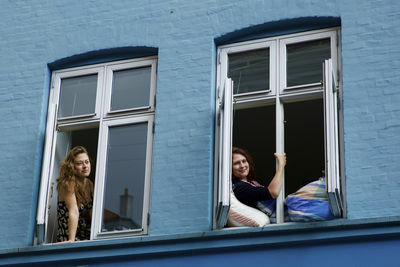 Supporters of the Red-Green Alliance march towards Faelledparken as banners in support are hung from windows along the route. International Workers' Day in Copenhagen. The Red-Green Alliance held a gathering at Blaagaardsplads before marching to Faelledparken to participate in the traditional Workers' Day event, where representatives from the Political Left and Centre-Left gave speeches, hereunder the Danish Prime Minister, Helle Thorning-Schmidt. 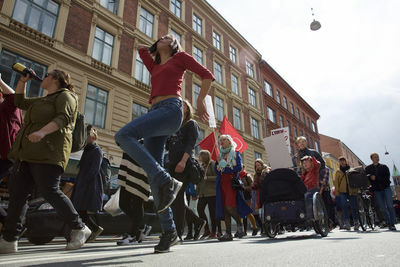 Supporters of the Red-Green Alliance march towards Faelledparken to the sound of music. International Workers' Day in Copenhagen. 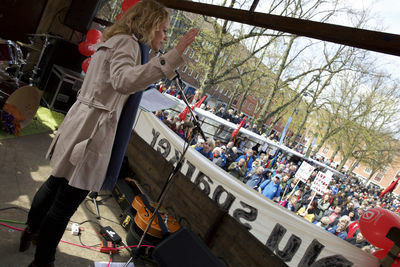 The Red-Green Alliance held a gathering at Blaagaardsplads before marching to Faelledparken to participate in the traditional Workers' Day event, where representatives from the Political Left and Centre-Left gave speeches, hereunder the Danish Prime Minister, Helle Thorning-Schmidt depicted as she is making her speech. International Workers' Day in Copenhagen. 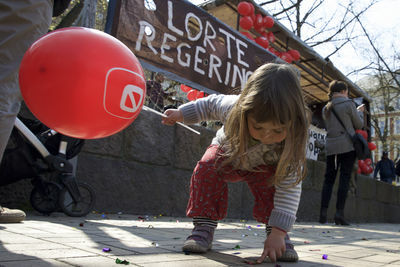 The Red-Green Alliance held a gathering at Blaagaardsplads before marching to Faelledparken to participate in the traditional Workers' Day event, where representatives from the Political Left and Centre-Left gave speeches, hereunder the Danish Prime Minister, Helle Thorning-Schmidt. Social Democratic supporters applauding the Prime Minister's speech at Faelledparken. 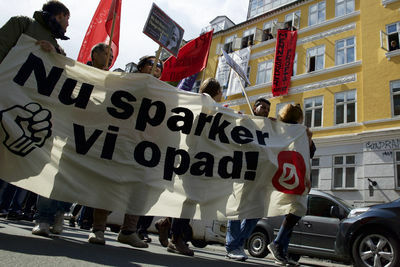 International Workers' Day in Copenhagen. 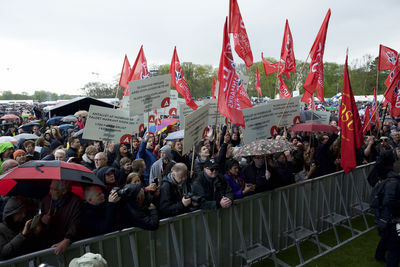 The Red-Green Alliance held a gathering at Blaagaardsplads before marching to Faelledparken to participate in the traditional Workers' Day event, where representatives from the Political Left and Centre-Left gave speeches, hereunder the Danish Prime Minister, Helle Thorning-Schmidt. 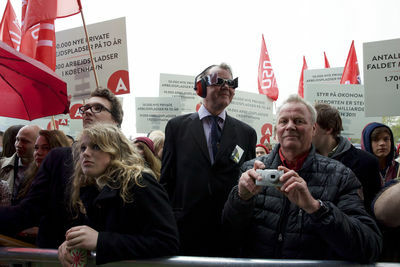 Social Democratic supporters applauding the Prime Minister's speech at Faelledparken, while a protester imititates a politician wearing ear guards, sun glasses and blinkers. International Workers' Day in Copenhagen. 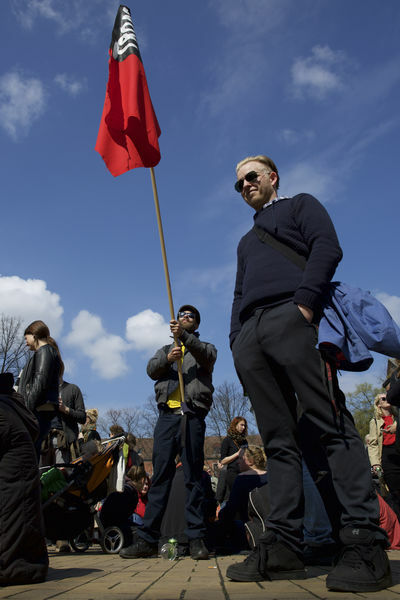 The Red-Green Alliance held a gathering at Blaagaardsplads before marching to Faelledparken to participate in the traditional Workers' Day event, where representatives from the Political Left and Centre-Left gave speeches, hereunder the Danish Prime Minister, Helle Thorning-Schmidt. 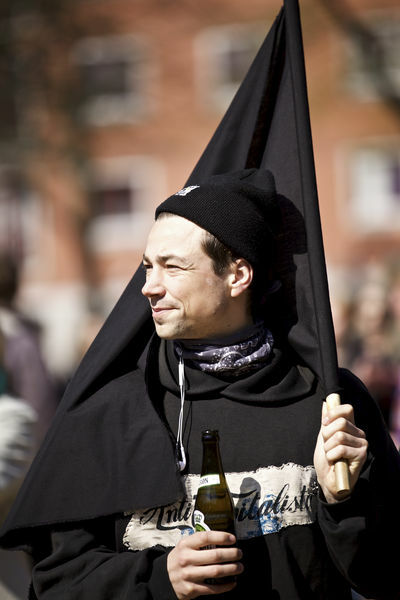 Here a protester from the Anarchists participating in the event on Blaagaardsplads. 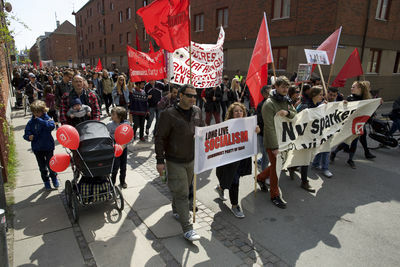 International Workers' Day in Copenhagen. 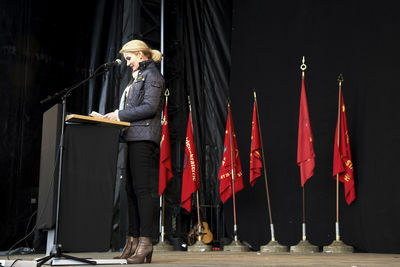 The Red-Green Alliance held a gathering at Blaagaardsplads before marching to Faelledparken to participate in the traditional Workers' Day event, where representatives from the Political Left and Centre-Left gave speeches, hereunder the Danish Prime Minister, Helle Thorning-Schmidt. Here supporters of the Red-Green Alliance gathered at Blaagaardsplads. 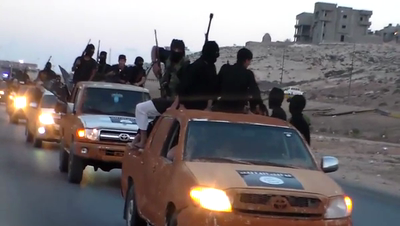 Video shot by an eyewitness at the end of February 2015 showing ISIS militants parading through the streets of the northeastern Libyan city of Derna. The fighters drive in convoys sounding their horns and showing off their guns and flags on a public highway in central Derna as they pass by civilian cars. It is night and the lights go out, the signal that announces the imminent beginning. In the courtyard, crowded with people, only silhouettes are distinguishable. The atmosphere is charged, but silence reigns. Almost everyone remains motionless except a newcomer trying to find friends in the crowd. Suddenly, a blinding light, followed by cries here, another there, and another... The fire has begun. The drums sound. The Correfoc, or “fire run,” finds its origins in the “devil dances” of twelfth century Catalonia. The very first one took place at the wedding of Barcelona’s Count, Ramon Berenguer IV. These “devil dances” were performed by actors dressed like demons between meals during noble banquets in the Middle Ages. The dance represented the fight between good and evil. People start running without a direction in mind. They are running away from the fire, pushing, pulling, eventually becoming attracted by that mysterious magnetism that has always existed between man and the pyrrhic element. At once, men dressed as devils carrying flares mix in the crowd. They light flares and begin to lash out at anything that moves. The sound of firecrackers and the hiss of sparks flying mix with the din of voices. Drums set the rhythm for the fire procession. The relative security offered by the open space of the square gives way to narrow alleys where devils and spectators huddle. The bravest hug and jump at the fire porters while the majority, fearful, just keep looking for a way to stay ahead of the flames. It is a frenetic tour through the old town, down narrow streets and through open squares, where troupes of devils dance and throw flames and sparks in all directions. At the end of the route, in a larger square, a great fire festival awaits the crowd. Large flares jump skyward while intrepid jugglers delight the audience with a host of tricks, spitting fire like authentic demons until the last flame is extinguished and silence falls on Gerona. Correfocs were once popular at different celebrations all around Catalonia. 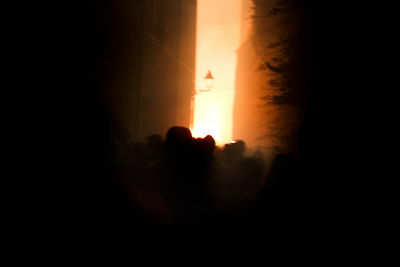 The first modern incarnation of the fire parade,however, took place in 1979 at Barcelona’s festival. This represented a comeback for the custom after many popular traditions were lost during the Franco dictatorship. Today, the Correfoc, like other traditional Catalan customs, is a way to preserve Catalonia’s cultural identity. 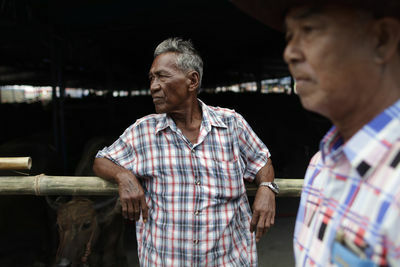 Thai farmers guard their buffaloes before the race. They will pay tribute to their hard working animals after a thriving year of farming. 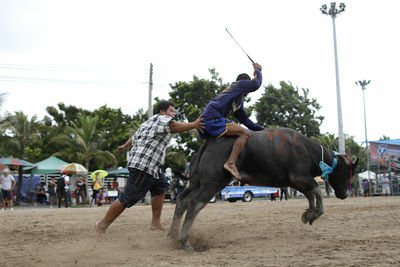 A Thai rider looks after his buffalo before the race. The races are spread throughout the day in intense heat. 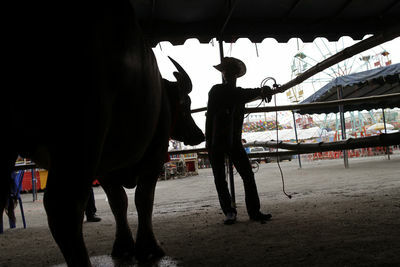 A farmer readies buffalos before the race. 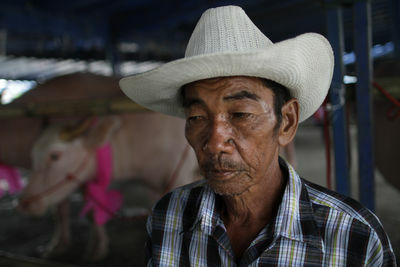 A thai farmer is seen before the race. Hundreds of farmers descend on Chonburi for the yearly festival. A farmer readies his buffalo before the race. A Thai farmer carries his buffaloes to the race field before the race. 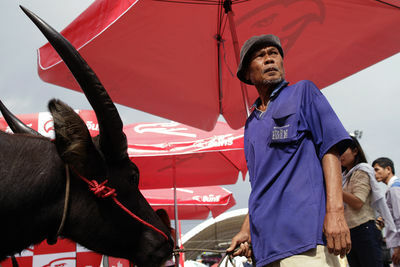 A thai farmer guards his buffalo in a promotional stand for fertiliser during the festival. A group of young girls promotes a fertiliser under the watchful eye of a Thai farmer and his buffalo. 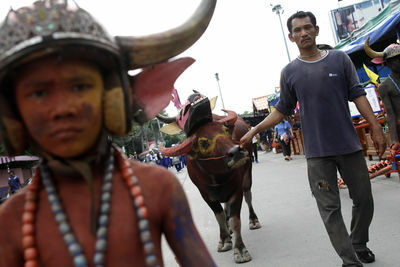 A thai young girl wearing a traditional thai dress takes a break during a parade within the 'Buffalo race festival'. 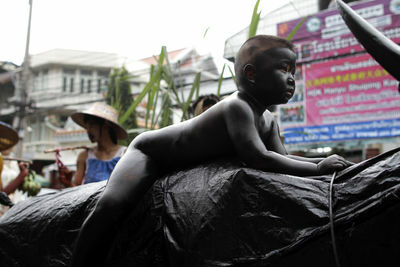 A Thai young kid rides a buffalo with his body painted in black during a parade prior the traditional buffalo race. 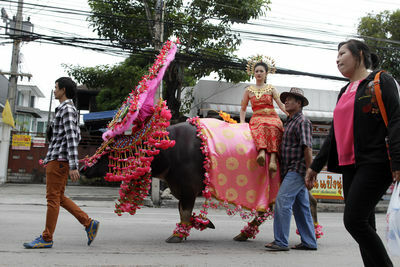 A Thai woman rides a decorated buffalo during the parade. 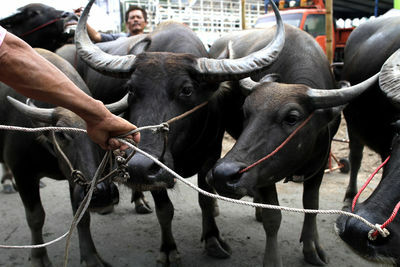 The weeklong festival offers a wide range of activities - but the main attraction is the buffalo race. A thai girl dressed up shows a flower during the parade. 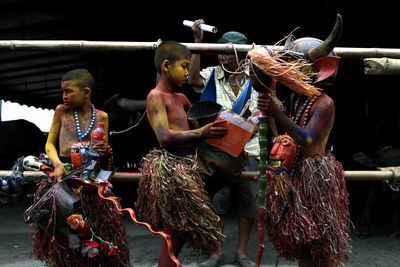 Local people wear different costumes (both regional and international) during such event. 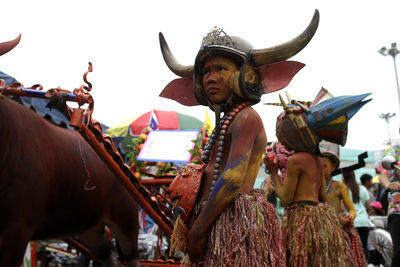 A painted buffalo is seen during a parade before the traditional race. The annual event is held to show gratitude to the buffaloes for helping out on the farm. 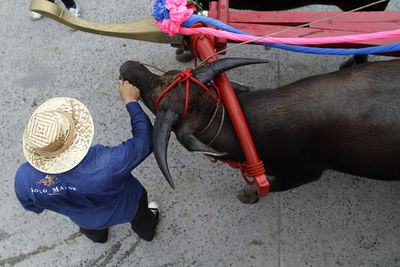 A Thai farmer carries his buffalo during the parade prior the race. The parade, which takes around 2 hours, goes round around the city to share the spectacle with locals. 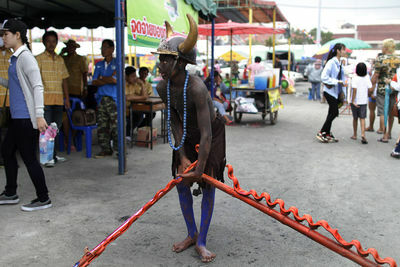 A Thai young kid wears tribal costume during the parade. 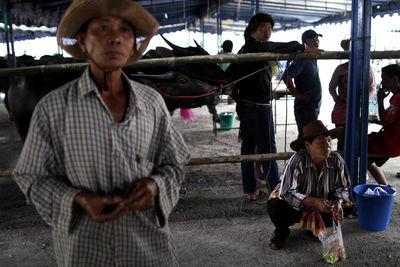 A Thai farmer is seen in the stables nearby the race field. 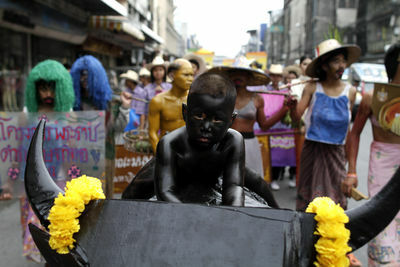 Thai children wear tribal costumes during the parade. 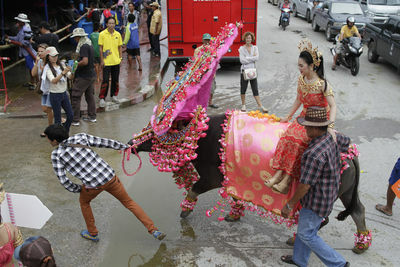 A Thai young kid helps to carry some buffaloes during the parade. Thai children enjoy the Festival. Some of them dream to become jockeys. A Thai farmer helps a jockey on his sprint during the training prior the official race. 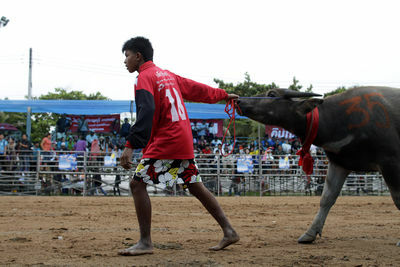 A rider pulls his buffalo to the start line during the warm up races. 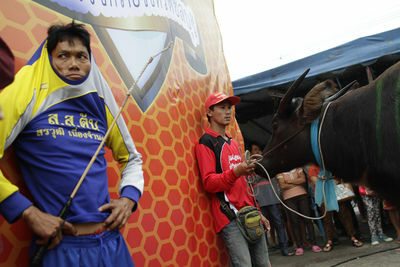 A Thai jockey takes a break between races. They need to be quite focused, since races require a lot of technique and strength.